The epic journey of four generations of Americans who carved a country with their bare hands. 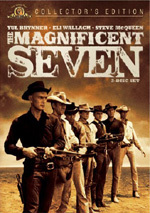 Henry Fonda, Gregory Peck, Debbie Reynolds, James Stewart and John Wayne are among the big names in this big-event saga following a dauntless family's move West through generations - underscored by the spectacles of a heart-pounding raging river ride, a thunderous buffalo stampede and a bracing runaway train shootout. Via technological advances, this panoramic winner of three Academy Awards can now be seen with a resplendent, restored clarity eliminating its original "three-panel join lines" and in roof-raising Dolby 5.1 audio. Explore a new home entertainment frontier with a classic movie adventure in a stunning new version never before possible! When I looked at the DVD specs for 1962’s How the West Was Won, I thought the case came with a misprint. It listed the film’s aspect ratio at 2.89:1. To date, I believe that Ben-Hur was the widest flick I’d ever seen on DVD, and that one stopped at 2.76:1. Won went beyond that for its super-wide presentation. It’s days like these I’m glad I have a 50” 16X9 set and not a 27” 4X3 TV. Won uses the three-panel Cinerama process, three directors and an all-star cast to tell a multi-generational tale of American history. We start in 1839 with the opening of the Erie Canal, an important westward water path. We meet the Prescott clan headed by father Zebulon (Karl Malden). He takes his family toward Illinois, and that launches our saga. They encounter adventure along the way, much of which revolves around daughter Eve’s (Carroll Baker) romance with mountain man Linus Rawlings (James Stewart). After some rocky times, Eve and Linus unite – and we don’t hear from them for decades. In the meantime, we leap to 1848 or so and spend time with the another Prescott daughter, Lily (Debbie Reynolds). She writes songs and performs them as part of a musical troupe now in St. Louis. Lily learns that a deceased benefactor left her a gold mine in California. A handsome flimflam man named Cleve Van Valen (Gregory Peck) learns of Lily’s newfound wealth and schemes to horn in on her success. She resists his entreaties, but inevitably the pair end up intertwined. We follow their adventures in California, and subsequent chapters show Linus and Eve’s son Zeb (George Peppard) through the Civil War, the expansion of the railroad, and the west’s problem with outlaws. In terms of basic visual impact, Won stuns. The ultra-wide ratio allows for broad vistas that create a wonderful impression of the locations. At virtually all times, the film remains gorgeous to the eye. As for the other senses, it becomes less than memorable. On the positive side, the episodic nature of the story becomes less of a flaw than I expected. I figured the flick would plod along without much consistency, especially given the presence of three separate directors. 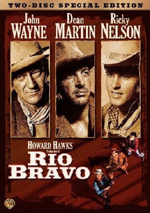 Henry Hathaway handles three of the chapters (“The Rivers”, “The Plains” and “The Outlaws”), while John Ford takes on “The Civil War” and George Marshall presents “The Railroad”. Happily, the various chapters mesh together pretty well. Expository narration links them together and allows them to flow without too much clunkiness. Of course, the decision to show the development of the Prescott clan over the years helps. Actually, Won feels like a mini-precursor to something like Roots in that way. While the story holds together in a fairly seamless manner, Won just never becomes especially interesting. Essentially it provides soap opera punctuated with occasional bouts of action. Each chapter frames the era with a quick history lesson, but the stories themselves don’t seem to have all that much to do with real-life events. The facts exist to set up the personal drama and that’s about it. This leaves us moderately disinterested in the characters and situations. Won becomes an epic due to its scope, but it lacks a great dramatic punch. Honestly, it often feels more like a glorified travelogue than a real movie, as its action usually seems like a basic excuse to show off the pretty pictures made possible by the Cinerama ratio. A few good action sequences materialize; in particular, the climactic train sequence works quite well. Scenes like this pop up infrequently, however, and too much of the movie seems less than involving. Some odd casting decisions occur, especially in the first chapter. The choice of Jimmy Stewart as a rough, “sinful” mountain man seems perplexing, to say the least. It would’ve made sense to swap Stewart with Peck, as the latter could’ve handled the rugged Rawlings in a much more natural manner, and the former would’ve been fine as a scheming character. Actually, Peck is quite good as Van Valen, but I would’ve liked him as Rawlings, and I’d have preferred Stewart as almost anyone else; he’s just an awful pick foe that role. In no way would I describe How the West Was Won as a bad movie, as it keeps us reasonably occupied during its extended running time. However, it feels like a missed opportunity. It presents wonderful visuals but doesn’t impress in terms of story, characters or drama. It’s a pedestrian film elevated by its terrific cinematography. 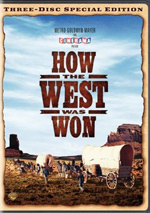 How the West Was Won appears in an aspect ratio of approximately 2.89:1 on this single-sided, double-layered DVD; the image has been enhanced for 16X9 televisions. This release’s producers clearly put a lot of love into this excellent transfer. One of the key elements of the image’s success came from the way it blended the Cinerama panels. Normally the format would suffer from noticeable “join lines” to connect its three panels, but the transfer was able to minimize those to a fine degree. I occasionally noticed slight join lines, but those instances occurred infrequently and never became more than a minor distraction. Indeed, if I’d not been looking for them, I probably wouldn’t have detected them at all. Everything about the transfer satisfied. Even in the movie’s many exceedingly wide shots, the image remained crisp and detailed. I was stunned by the absence of soft spots, as I expected to see signs of fuzziness throughout the flick. These didn’t exist, as the movie stayed distinctive and well-defined at all times. No issues with jagged edges occurred, and only slight shimmering cropped up along the way. I noticed no edge enhancement, and source flaws were a non-factor. The film remained clean and fresh from beginning to end. With its natural palette, Won exhibited lovely colors. The tones always seemed full and pleasing. Blacks were dark and dense, and shadows were acceptable. The film displayed some of the worst “day for night” imagery I’ve seen, mostly because some of the nighttime shots looked like they took place in the middle of the day; I only knew that they were supposed to be at night because the characters said so! Nonetheless, low-light shots were fine when they popped up on infrequent occasions. Really, I found almost nothing about which to complain through this stunning transfer. Almost as good, the Dolby Digital 5.1 soundtrack of Won was well above average for its age. The soundfield opened up matters in a pleasing manner. Music fared especially well, as the score spread across the front speakers and also used the surrounds to bolster those elements. Some directional speech offered generally well-placed dialogue throughout parts of the movie, and effects broadened across the front in a satisfying way. Though the music dominated the forward spectrum, the effects added a fair amount of action to the proceedings. Those elements were put into the right spots and meshed together nicely. The surrounds contributed a little in terms of effects, though they remained focused on the front. A Civil War battle used the back speakers well, and a couple of split-surround elements popped up as well. For instance, I heard a train whistle isolated in the right rear channel, and the song at the film’s end used stereo singing in the back. While the surrounds weren’t terribly active, they brought out good information. Audio quality was quite good given the movie’s vintage. Speech seemed acceptably natural and concise; the lines lacked edginess and were always perfectly intelligible. Music showed the film’s best range, as the score seemed pretty lush and lively. Effects could be a bit thin, though they added some decent low-end at times. For instance, explosions and roaring rapids boasted nice bass response. While the audio didn’t match up with the stellar visuals, the soundtrack was very satisfying for a movie from 1962. Only two major extras appear here. In addition to DVD One’s trailer, we get an audio commentary spread across DVDs One and Two. This piece features notes from filmmaker David Strohmaier, Cinerama Inc. director John Sittig, film historian Rudy Behlmer, music historian Jon Burlingame, and stuntman Loren Janes. In this running, screen-specific track, it appears that all except Burlingame sit together; it sounds like his remarks come from a different session. The participants discuss cast and crew, the Cinerama process and its challenges, score and songs, sets and locations, stunts, characters and performances, the work of the three directors, and various anecdotes from the shoot. All of this packs a lot of good information into the film’s running time. The participants cover the important aspects of the flick’s creation well, and they manifest a lot of enthusiasm for the project. I especially like the fact that they all tell us their reactions to West when they first saw it, as that adds a nice tone of admiration to the piece. This becomes a consistently informative and engaging commentary. Over on DVD Three, we find a documentary called Cinerama Adventure. Hosted by Strohmaier, this one-hour, 36-minute and 46-second show presents notes from Behlmer, Janes, inventor Fred Waller, Cinerama crew members Mike Todd, Jr. and Jim Morrison, production secretary Jane MacLardy Schacht, film historians Leonard Maltin and Kevin Brownlow, film producer AC Lyles, the International Cinerama Society’s Howard Rust, Cinerama historian Greg Kimble, Waller’s stepson John Caron, History of Cinerama author Thomas Erffmeyer, Vitarama cameraman John Primi, Widescreen Cinema author John Belton, European Theater aerial gunner Frank Foulkes, aerial gunnery trainee Bill Martinez, Lowell Thomas associate and director Otto Lang, Cinerama location scout Lowell Thomas, Jr., Cinerama sound developer Hazard Reeves’ son Alex, Cinerama producer Merian C. Cooper, Cooper associate Charles FitzSimons and son Richard Cooper, former Cinerama VP Wentworth Fling, Cinerama assistant editor David Blangsted, Cinerama composer David Raksin, Cinerama Public Relations Saul Cooper, Cinerama marketing VP Arthur Manson, Cinerama Production Department’s Gloria Tetzlaff Conroy, Cinerama producer Bob Bendick, Cinerama cameraman Gayne Rescher, pilot’s son Greg Mantz, associate producer Louis de Rochemont III, biographer Roy Webb, producer Carl Dudley’s daughter Carol Dudley Katzka, South Seas Adventure co-producer Richard Goldstone, European Cinerama president Nicolas Reisini’s son Andrew, Turner Entertainment president Roger Mayer, West producer Bernard Smith, filmmaker Joe Dante, Wonderful World of the Brothers Grimm director Henry Levin, stuntman Bob Morgan, and actors Carroll Baker, Debbie Reynolds, Eli Wallach, Claude Johnson, and Russ Tamblyn. “Adventure” looks at the origins and development of Cinerama as well as aspects of its processes. We also hear about its inventor and others involved in its early days, the impact of Cinerama, working with the format and related challenges, elements of some productions, and Cinerama’s legacy. If you want a pretty thorough look at Cinerama, “Adventure” is the place to go. The program digs into many aspects of the format’s history in a complete way that gives credit to the folks who helped bring it to fruition. This can be a dry piece, I must admit, as it’s not always especially involving. Nonetheless, it covers its subjects well and offers nice info. As one of only two narrative flicks shot with the three-panel Cinerama process, How the West Was Won merits a special place in history. That doesn’t make it a particularly engaging film, however. It always looks great, but it fails to present especially involving characters or story. The DVD offers excellent picture quality, very good audio, and some informative extras. This is an impressive release.